"I think he wants to get it done. I really feel that very strongly," President Trump says of the pledge by North Korea's leader Kim Jong Un to end a decades-old nuclear stand-off. While the brief statement touched on a range of topics, it was short on details. At a lengthy news conference after the summit, Trump was asked about North Korea's willingness to give up its nuclear weapons program. "We're starting that process very quickly — very, very quickly," the president said, though he declined to give a timeline and acknowledged that it can take a long time to dismantle a nuclear program. "We'll be verifying" that North Korea fulfills its promises, Trump said. Without describing how that would happen, the president added that both Americans and international personnel would play a role in the process. When Trump was asked if he trusts Kim, he replied, "I do. I do." The president later added, "I think he wants to get it done. I really feel that very strongly." North Korean leader Kim Jong Un reaches to shake President Trump's hand at the Capella resort on Sentosa Island in Singapore on Tuesday. After noting the failure of previous U.S. efforts to get North Korea to abandon its nuclear weapons program, Trump said, "honestly, I think he's going to do these things. I may be wrong. I mean, I may stand before you in six months and say, 'Hey, I was wrong.' "
"I don't know that I'll ever admit that," Trump added, "but I'll find some kind of an excuse." "We will be stopping the war games, which will save us a tremendous amount of money," Trump said. "Plus I think it is very provocative." Trump's comments appeared to catch South Korea off-guard. A statement issued by the office of South Korean President Moon Jae-in said, "At this moment, we need to figure out President Trump's accurate meaning and intention." The military exercises have been taking place annually since the 1970s and are a cornerstone of the U.S.-South Korea security relationship. However, they have been suspended or delayed occasionally, as they were during the Winter Olympics in South Korea earlier this year. The deal doesn't call for the U.S. to reduce its large military presence in South Korea, Trump said — but he added that it's something he would like to do in the future. "I want to get our soldiers out," Trump said. "I want to bring our soldiers back home. We have, right now, 32,000 soldiers in South Korea, and I'd like to be able to bring them back home. But that's not part of the equation right now. " 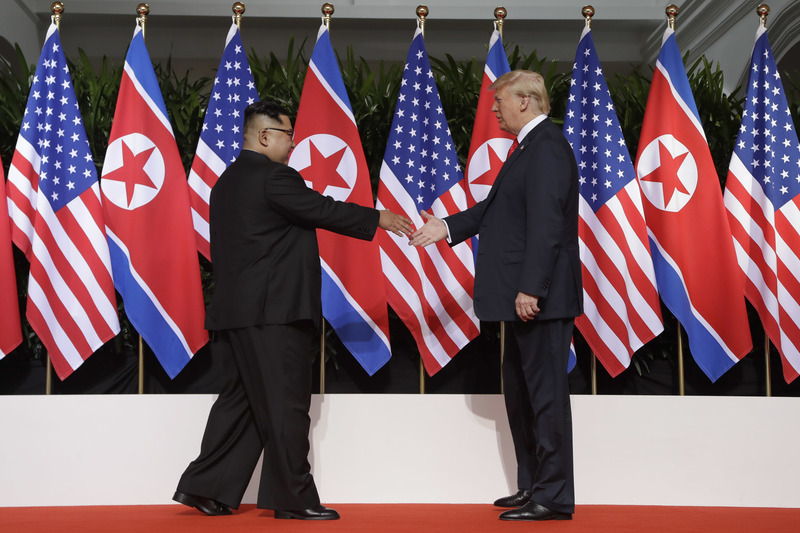 The Trump-Kim agreement said the U.S. and North Korea would "join efforts to build a lasting and stable peace regime on the Korean peninsula," and commit to recovering the remains of soldiers from the 1950-53 Korean War. Trump was asked about the death of U.S. college student Otto Warmbier, who was in a coma when he was released last year after being held for more than a year by North Korea — but died soon after his return to the U.S.
"I think without Otto this would not have happened," Trump said in reference to the summit. "It was a terrible thing, it was brutal. But a lot of people started to focus on what was going on, including North Korea. I really think Otto is someone who did not die in vain." On the most important issue — North Korea's nuclear program — it wasn't immediately clear whether Tuesday's statement went much beyond diplomatic platitudes or the multiple previous agreements North Korea has signed in the past. Nor is it clear the two sides have a common definition of exactly what "denuclearization" entails. The joint statement did call for "follow-on negotiations" to be led by Secretary of State Mike Pompeo and top North Korean officials. Pompeo is heading to South Korea to meet counterparts there and from Japan. 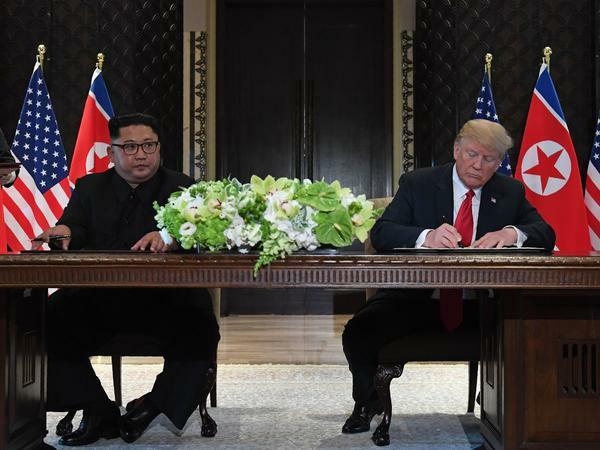 "People are going to be very impressed, people are going to be very happy and we're going to deal with a very big and dangerous problem for the world," the president said as the two signed documents. "It worked out for both of us better than any of us could have expected. This is going to lead to more and more and more. It's an honor to be with you, it's a great honor," he said to Kim. Following the handshake, the president said, "I feel really great." "We're going to have a great discussion and, I think, tremendous success," Trump said. "It will be tremendously successful. And it's my honor. And we will have a terrific terrific relationship, I have no doubt." "Well, it was not easy to get here," Kim said, smiling. Through an interpreter, he said "old prejudices and practices worked as obstacles on our way forward. But we overcame all of them, and we are here today." After an approximately 38-minute one-on-one meeting, with only the leaders and their interpreters, the two proceeded to an expanded bilateral meeting with advisers. The U.S. side included Pompeo, National Security Adviser John Bolton, and and the president's Chief of Staff John Kelly. North Korea's team included Vice Chairman Kim Yong Chol, Foreign Minister Ri Yong Ho and former Foreign Minister Ri Su Yong. President Trump gives North Korea leader Kim Jong Un a thumbs up at their meeting at the Capella resort on Sentosa Island in Singapore on Tuesday. Following the bilateral, the delegations sat down to a lunch of beef ribs and sweet & sour pork. "Getting a good picture everybody?" Trump asked photographers before the two sides took seats. "So we look nice and handsome and thin? Perfect," he said. Emerging from the working lunch, the president, with Kim beside him, told reporters that there had been "a lot of progress — really very positive. I think better than anyone could have expected. Top of the line, very good." In some instances, past deals struck by previous U.S. administrations with North Korea paused — but failed to roll back — North Korea's program, which has only grown over the years. "In light of how many flimsy agreements the United States has made in previous years, this president will ensure that no potential agreement will fail to ultimately address the North Korean threat," Pompeo told reporters in Singapore on Monday. North Korea signed onto a goal of "complete denuclearization" of the peninsula in an April 27 declaration with South Korea. Pyongyang has advocated for decades for a peace treaty to formally end the Korean War, rather than the armistice that has been in place for more than 60 years. 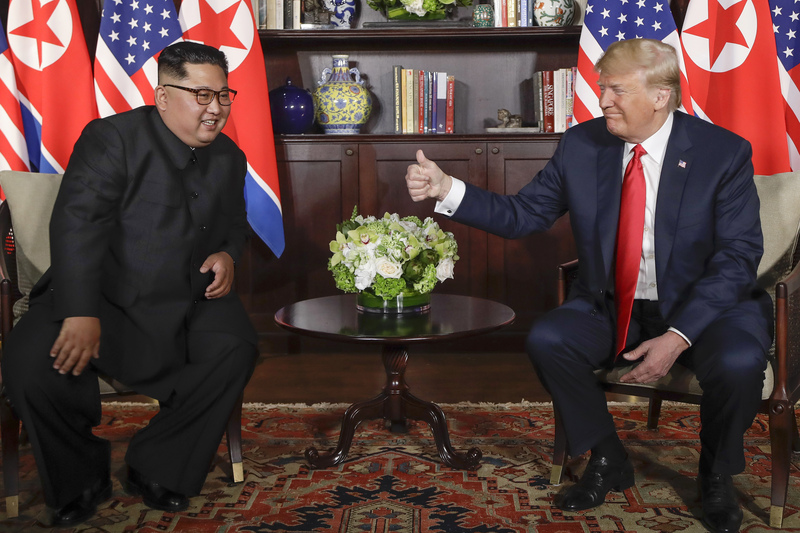 North Korea also wants an end to what it considers America's "hostile policy" and a security guarantee that the U.S. will not seek to remove the regime. Under Kim Jong Un, the third-generation dictator of the country established in 1948, North Korea has rapidly advanced its nuclear capabilities. Four of the nation's six nuclear tests have taken place since Kim took power in 2011. Last fall, despite numerous rounds of international sanctions, Pyongyang conducted its farthest-reaching test launch of an intercontinental ballistic missile, which in theory could reach the United States mainland. In the past two months, he has met twice with South Korean President Moon Jae-in and twice with China's leader Xi Jinping. He also hosted Russia's Foreign Minister Sergei Lavrov. Myre and Chappell reported from Washington. Se Eun Gong contributed to this report from Singapore and Scott Neuman contributed from Washington.